An SJSU student volunteer works with elementary school children through CommUniverCity. San Jose State’s unique CommUniverCity program, which marked 10 years of service to the San Jose community this year, was honored at the Association of Public and Land-grant Universities (APLU) annual meeting Nov. 17 with the C. Peter Magrath Community Engagement Scholarship Award. 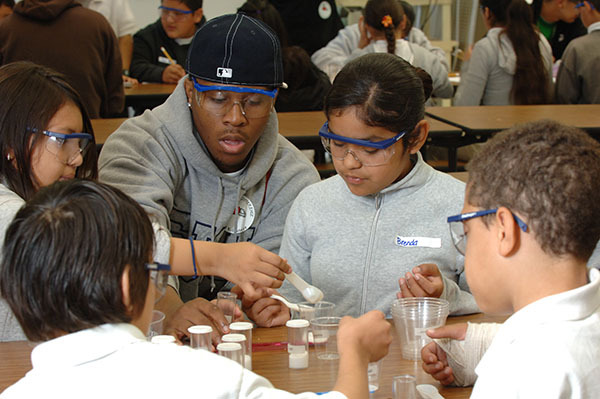 For a decade, San Jose State students, faculty and staff have fostered a unique partnership with the City of San Jose and community organizations through CommUniverCity. The collaboration supports residents in neighborhoods that surround the campus with such activities as after-school tutoring, nutrition education, adult financial literacy classes and much more. For the last five years, CommUniverCity has been involved in College Day with volunteers visiting 13 downtown schools this year. Volunteers included SJSU students, staff, faculty and alumni who spent an hour each visiting 50 K-12 classrooms in an effort to get younger students thinking about college. Lorri Capizzi, a lecturer in the counselor education department in the Connie L. Lurie College of Education, motivated students in one of her courses to adopt Lowell Elementary School for College Day. College Day participation is just one of more than 50 community action projects that together brought national recognition to CommUniverCity this fall. Representatives from each college are involved in projects. Provost Andy Feinstein and CommUniverCity Associate Director Katherine Cushing, who is also an associate professor in the College of Social Sciences environmental studies department, traveled to Indianapolis to represent SJSU at the APLU meeting where the winner of the C. Peter Magrath Community Engagement Scholarship Award was announced. Dayana Salazar, the executive director of CommUniverCity and a professor in the College of Social Sciences urban and regional planning department, said she and her office colleagues jumped up and down when they got the news from Feinstein that they had won. Salazar said there is potential for sharing the model with other universities and cities as well as more opportunities to delve deeper into the established programs in San Jose.